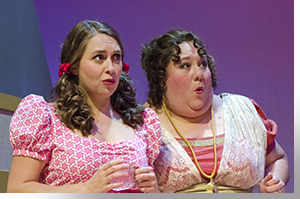 After 205 years, playwright Kate Hamill does for Jane Austen what Jane could not do for herself, by turning up the volume on the women's voices in this English literary classic, as we see in this production at Boulder Ensemble Theatre Company. When it was published in 1813, Jane couldn't put her name on the book, and her brother had to execute the contract with the publisher; today, women are rewriting the social contract. Hamill's script follows the original storyline and borrows deftly from its narrative and dialogue, but emphasizes Austen's insightful and scathing evaluations of living in a patriarchal society, 116 years before Virginia Woolf published her renowned essay, "A Room of One's Own." 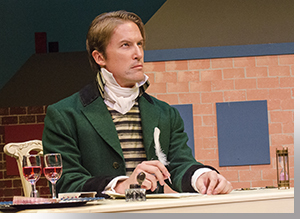 In doing so, Hamill enhances the universality of Austen's humor as well, which director Rebecca Remaly niftily amplifies by adding game elements, such as marking the stage with the schema from the Regency Period board game "Mansion of Happiness"—designed to teach women "how to make your house a happy one"—which, along with a deck of cards, an etch-a-sketch, a rubber ball, and a crossword puzzle book in the hands of the characters, keeps things light. Diana Dresser's choreography of the period dances is lovely. Austen, speaking especially through Lizzy, lays bare how the laws of primogeniture and the nature of capitalism degrade love into arranged and contractual marriages, to benefit the finances of the merging families. Lizzy, who values love over capital, aspires to a transcendent relationship. Austen's story of how Lizzy attains this remains one of the most popular novels among the literati. In this poignant, funny, and heartwarming production, Hamill keeps the focus on the women's hearts. As Lizzy, Candace Joice is front and center for much of the evening—her finely nuanced performance a remarkable blend of bravado, humility, and love—and delivers a catharsis as rich as the book on which her story is based. As noted, the men in Hamill's script are dialed back in relationship to the women, thus seeming to be from a different world which, given the women's point-of-view, appears wooden and clueless. 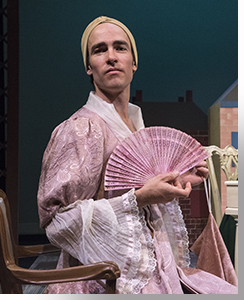 Though Mr. Darcy fits this mold, Zachary Andrews mines both the formality and confusion in Mr. Darcy's behavior, as he is both judicious lord and awkward suitor. Remaly's cross-gender casting hits the bulls-eye as well. Lindsey Pierce is a hoot embodying the wit, sarcasm, and precarious patience of Mr. Bennet, which plays off humorously with Mrs. Bennet: Leslie O'Carroll's histrionic litanies over the vicissitudes of her efforts to marrying off her four daughters (in this play; five in the book) to any man with a sizeable annual stipend from his family's estate. Mrs. Bennet's assumptions as a matchmaker are drawn from the first sentence in the novel: "It is a truth universally acknowledged, that a single man in possession of a good fortune, must be in want of a wife"—a sentence filled with playful irony, though this escapes Mrs. Bennet. While Lizzy's feelings for Darcy are occluded by a false narrative from Wickham (Brian Kusic), as well as her suppression of any yearnings for love and marriage, she is proactive in protecting her sisters, in the face of her mother's fixation on money and her father's studied indifference. Her number one concern is the sweet, lovely, and innocent Jane (Anastasia Davidson), who becomes quite taken with Mr. Bingley (Casey Andree). Davidson's romantic odyssey, from smitten to jilted to redeemed is a dramatic gem that brings the family's precarious situation to the brink. 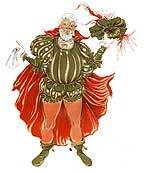 Davidson in disguise, is also great fun as the heavily veiled Miss de Bourgh, a thoroughly odd and eccentric creature. While Hamill has fun at Bingley's expense, turning him into Mr. Darcy's lapdog—first, regarding Mr. Darcy's thoughts on Jane, to whom Bingley was attracted and of whom Mr. Darcy thought standoffish; and then, returning to Jane, when Mr. Darcy's opinion of her changes, due to Lizzy's honesty and strength—but his guilelessness shows through in Andree's portrait. 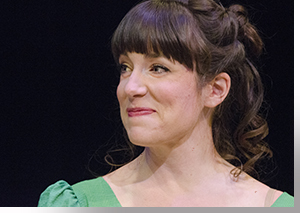 In alternate scenes, Andree brings down the house as Mary Bennet, the strange, left out sister. The wild daughter, Lydia (Adeline Mann) and the unscrupulous Wickham (Kusic) cause a scandal that threatens to ostracize the Bennets from polite society and doom any providential marriages. Mann is thoroughly captivating as the saucy, adventurous lass, and Kusic conjures in our minds a dark cloud looming over Wickham. Once again, Mr. Darcy comes to the rescue. 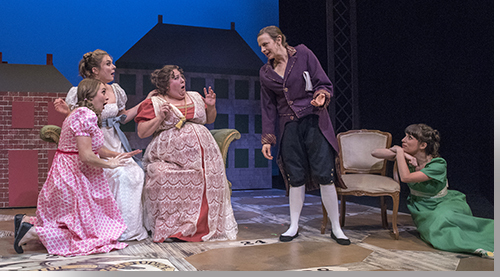 When Lydia and Wickham are offstage, Mann intimidates as the imperious Lady Catherine, while Kusic is a perfect pill as the snide Miss Bingley and the insufferable pastor, Mr. Collins, who turns Austen's opening sentence on its head. And, of course, thanks to Mr. Darcy, it all works out, just as we like it. 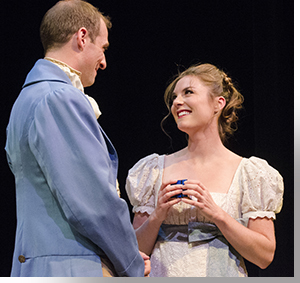 Boulder Ensemble Theatre Company's presentation of Pride and Prejudice, by Kate Hamill, adapted from the novel by Jane Austen, runs through October 7, 2018. For tickets: https://betc.org/event/pride/.